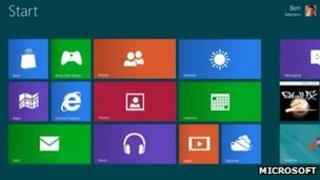 A potential trademark dispute has forced Microsoft to drop the Metro name for Windows 8's blocky, tile-based interface. Talks with an "important European partner" have brought about the change according to internal memos seen by tech news site The Verge. The tiled interface is used on both Windows 8 and Windows Phone and has been called "Metro" ever since Microsoft started showing off its designs for the software. Elements of it have also been used on older products such as the Zune media player. In documents sent out to developers and media months ago, Microsoft said Metro was the "code name for our design language". It added that Metro was picked because the name was "modern and clean. It's fast and in motion". Now documents sent out to developers are warning coders to avoid using the word when referring to the distinctive interface. The warning is believed to follow on from an internal memo sent by Microsoft's Legal and Corporate Affairs department which said the company had been threatened with legal action over its use of the name. The threat is believed to have been made by German retailer Metro AG, which owns trademarks on the word. Metro AG declined to comment on the claim. Instead of Metro, Microsoft has told developers to simply refer to the blocky display as a "Windows 8 style UI" for the time being. In a statement, Microsoft said: "We have used Metro style as a code name during the product development cycle across many of our product lines. "As we get closer to launch and transition from industry dialogue to a broad consumer dialogue we will use our commercial names," it said.